Zoeva is a brand I've heard SOO much about, their known for their amazing quality brushes and affordable prices. I've been debating buying the full set for a while but I wouldn't use all of the brushes so it seemed a bit of A waste. Zoeva is a German brand (which I didn't know until I just so happened to find them in a drugstore in Germany) Their brushes come in both rose gold and silver, I had always fancied the rose gold but the shop didn't have any but I wasn't leaving without buying at least one. 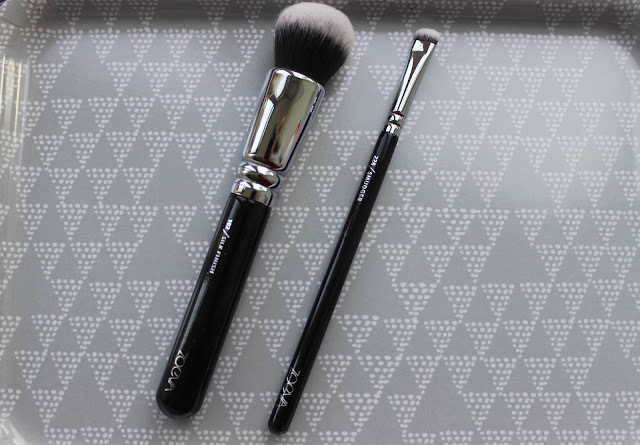 Firstly I bought the 102 Silk Finish brush which is a foundation and mineral make-up brush. I bought this to replace my real techniques brush which I have had for quite a while, I was expecting amazing things from these brushes due to many amazing reviews and i definitely wasn't disappointed. It blends my foundation amazingly and its SO soft! I would 100% recommend trying this out! I also purchased the Zoeva 226 smudged brush I didn't purchase this for myself I got this for my mum but I thought I'd put it in anyway. This is a eyeshadow brush use to blend eyeshadow, It's a lot more sturdy compared to the RT brushes making it easier to apply. I'm glad I finally got to try out the Zoeva brushes they are such good quality and they are definitely worth the money! I've asked for the Zoeva's eye brush collection for Christmas! <3 I cannot wait to try them! I'm so glad to read another good review about them! These are so pretty! They would be so nice to try! Really want to try out some of Zoeva's brushes they sound amazing! Love the look of the silk finish brush you chose!